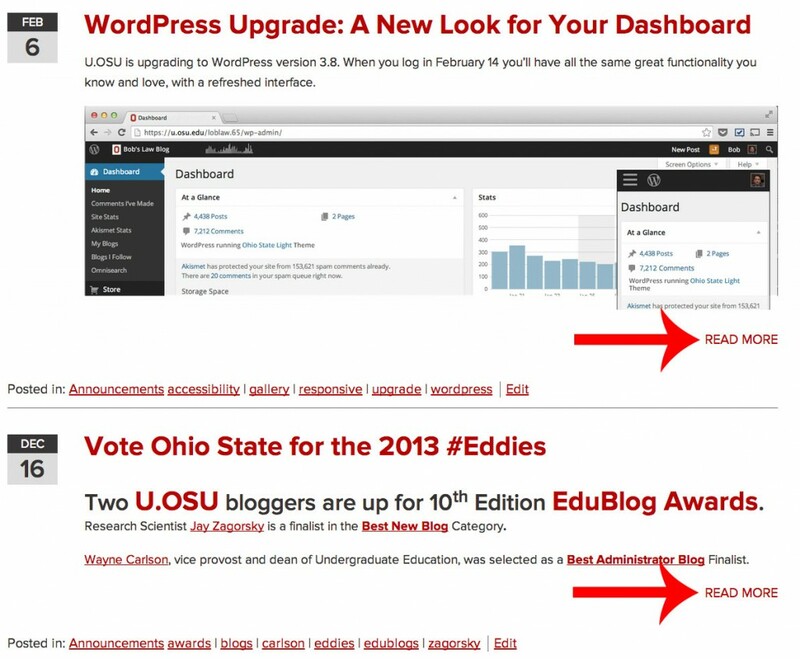 You might notice that the default U.OSU display settings show entire blog posts rather than snippets of your recent entries. This can make browsing through headlines a serious workout for your scroller. A quick, simple way to keep your blog roll nice and tidy is to include Read More tags in your posts. When writing a post, find the best point to insert a break in your content, click the “Insert More Tag” button, and voila! You will see the “Read More” line across your post. Anything above that break will be displayed from your blog’s front page, and the rest of the post is available by clicking Read More (or, if you link directly to a post rather than your blog page). In the age of skimming headlines and breezing through tweets for selective news consumption, your readers will appreciate a denser list of articles to peruse. Don’t be surprised when they want more!